Sometimes, the balloons would break lose from their tethers and wreak havoc on the city. It was quite the scare. 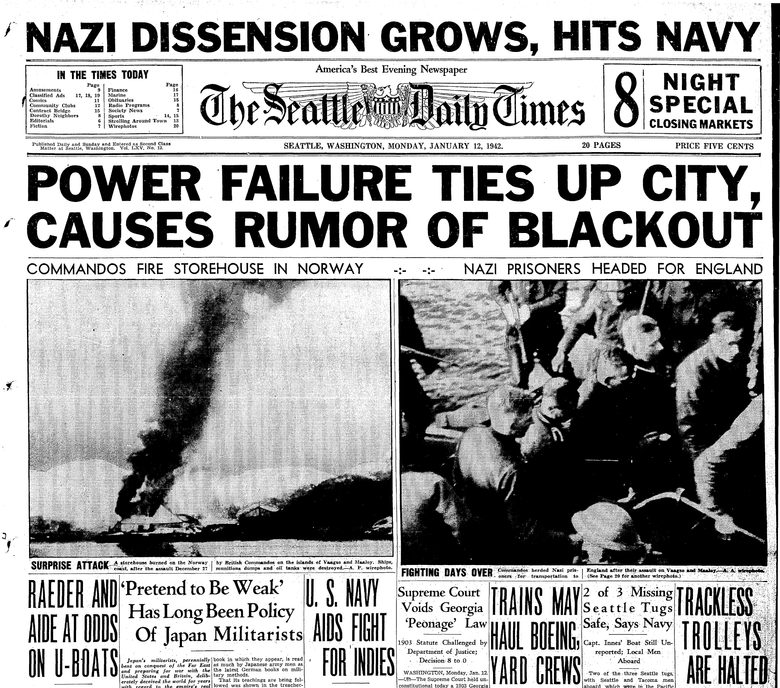 About a month after the Pearl Harbor attack, the city of Seattle lost power and went black. An air-raid siren blasted on Queen Anne. Trackless trolleys stopped working. Heat shut off in many buildings. Radio stations went silent. Thankfully, the siren was just a test, and the city streets were not darkened on purpose. Seattle City Light and the Puget Sound Power & Light Company initially remained mum on what had caused the widespread power outage. “Officials of the two power systems said the reason for the power failure could not be disclosed,” The Times reported that day. But the mystery did not linger long. 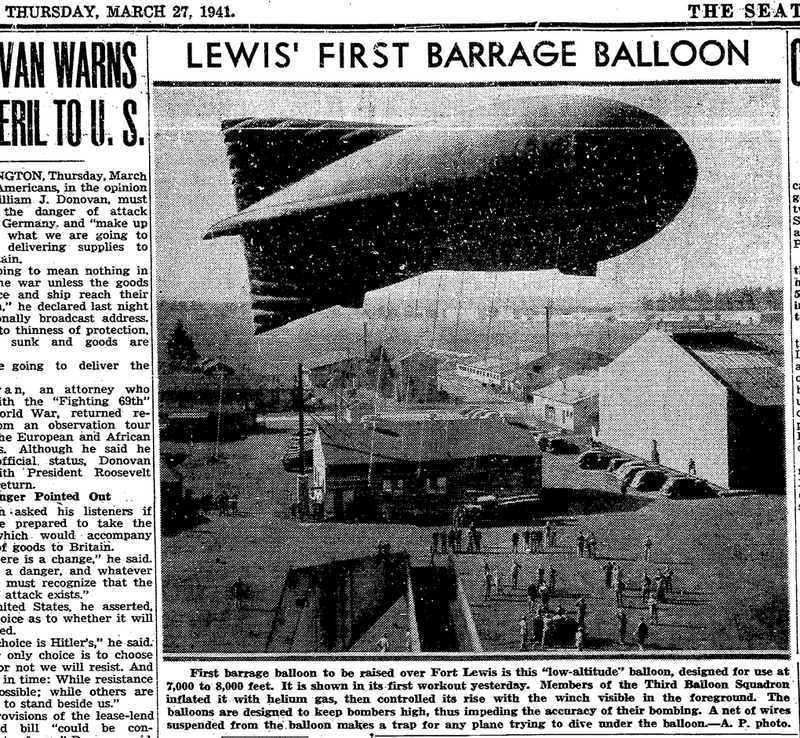 Children had seen a balloon floating by the Broadview School during the outage, and the Army admitted to The Times that soldiers were searching for “a runaway captive balloon” seen drifting toward the Cascades. The Army explained that soldiers at Fort Lewis had been testing barrage balloons, which are large helium balloons with cables suspended beneath. The balloons’ cables were designed to prevent enemy bombers from flying near the ground, where they would be able to drop munitions more accurately. But on Jan. 12, a gust of wind had torn the Fort Lewis balloons from their moorings. One of the balloons dragged a steel cable across North Seattle power lines, causing the mayhem. 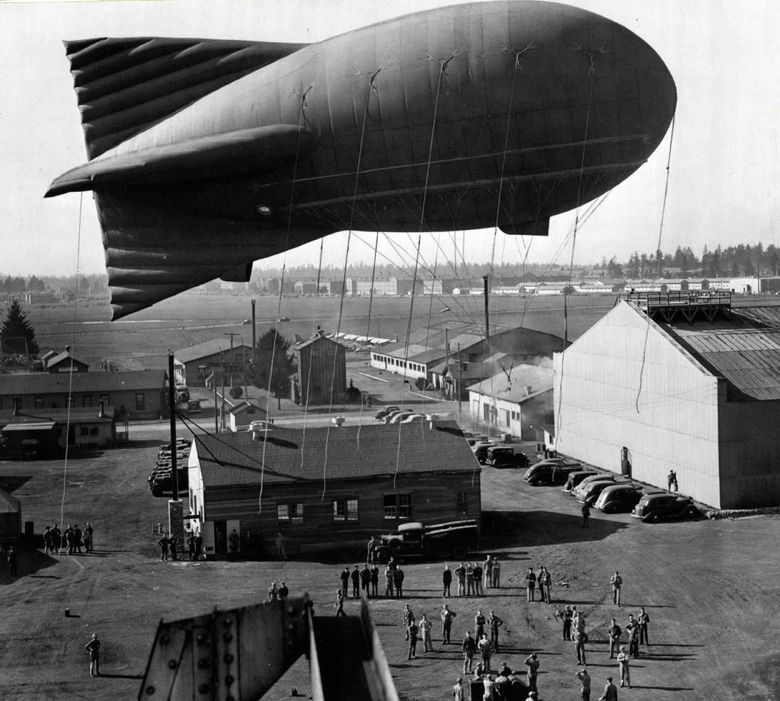 The barrage balloons would become something of an accepted wartime menace for Seattleites. 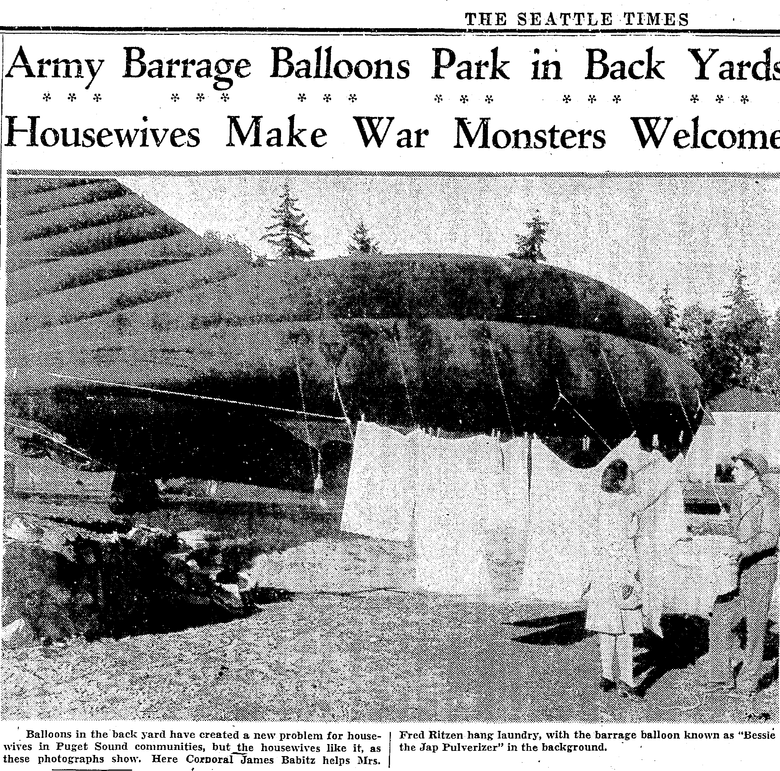 The Army parked some balloons in Puget Sounders’ backyards, where soldiers maintained the giant “bags,” as they were also called. “Almost all the housewives who have troops in their yards welcomed them like guests, did their best to provide hot water, electric extensions and other conveniences. Most of them have a sort of tea for their balloon squad once a week or so and serve cakes and cookies and coffee,” The Times reported. Unfortunately, the barrage balloons had a tendency to become untethered in the wind and sail away. 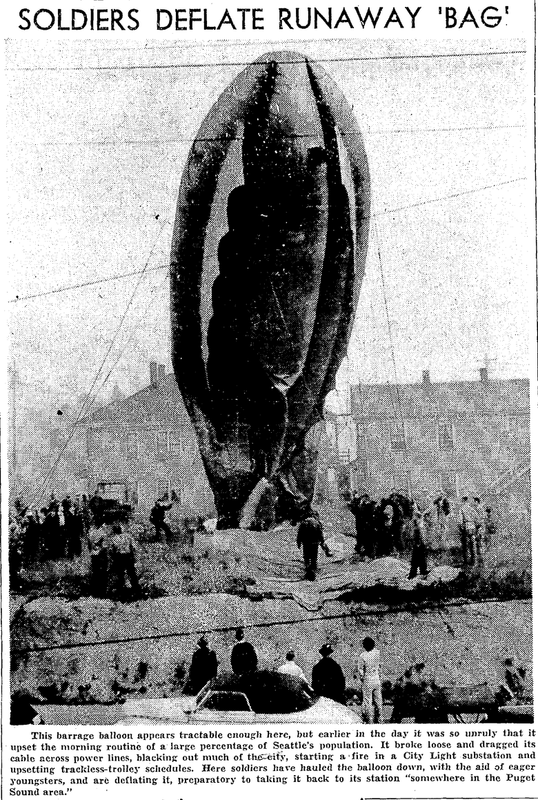 The Times documented at least a half-dozen runaway balloons in 1942. Most of the time, they’d float along harmlessly. Occasionally, the balloons wreaked havoc. In October that year, a balloon stopped trolleys, blacked out the city and caused a fire with “heavy smoke and strong fumes” in a Seattle City Light substation. In February 1943, seven Army soldiers were hurt when a barrage balloon caught fire.